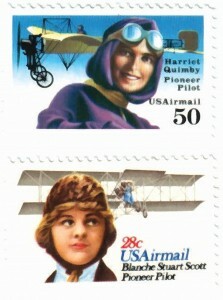 Harriet Quimby (top), the first American woman licensed as a pilot, in 1911, appeared on a 50cent airmail stamp in 1991. Blanche Stuart Scott, the first American woman to solo in 1910, appeared in 1980. On Sept. 25, 1911, Postmaster General Frank Hitchcock presided over the first airmail flight, from Garden City, N.Y., to Mineola, on Long Island, N.Y., a distance of 1.7 miles. A year later, the first aviation stamp, a 20?cent parcel post stamp, was released. 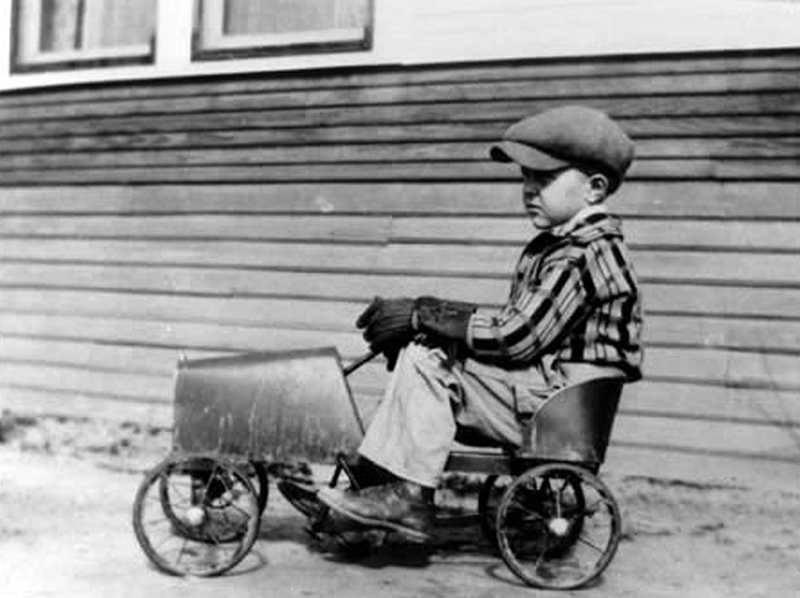 It coincided with the first unofficial airmail flight in the nation from one post office to another, South Amboy, to Perth Amboy, in New Jersey, a leap of 3.8 miles. The stamp showed a Curtiss Model D pusher flying over a mountainous area—hardly realistic for the fragile, near-skeleton of a plane. In 1917, Congress appropriated $100,000 for an airmail service. By 1918, the Post Office had authorized airmail and produced a new stamp to promote it. The rate was 24 cents per ounce, and the stamp received a great amount of publicity—more publicity than many stamps that followed. An unknown number of sheets were printed with the Curtiss JN-4 Jenny upside down. Only one sheet of 100 stamps was actually sold, and today, about 80 of the stamps are in private collections. The Post Office reissued the JN-4 Jenny stamp in 1997; at that time, the plane was flying straight and level. In October 1903, Samuel P. Langley made two failed attempts at powered flight in his Aerodrome, from a houseboat on the Potomac River. Langley received $50,000 from Congress to develop his aeroplane, and his years of experiments provided inspiration for later innovators, including the Wright brothers, Glenn L. Martin and Glenn Curtiss. Eighty-five years later, in May 1988, Langley was honored on a postage stamp. Octave Chanute (top left), an American civil engineer, improved on Otto Lilienthal’s glider designs. 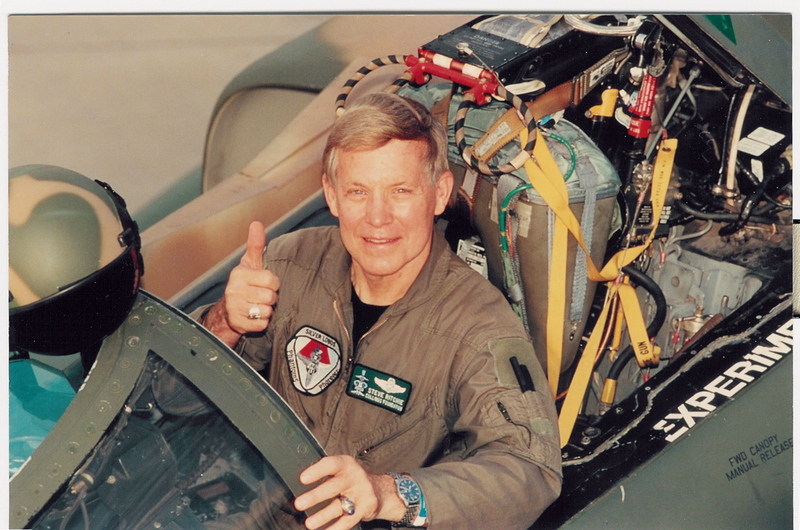 While in his 60s, he collected and disseminated aviation information. The Postal Service honored him and his biplane hang glider on a pair of stamps 1979. 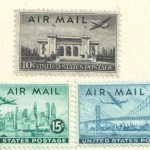 New airmail stamps appeared irregularly at first, usually to commemorate an historical event. An 8?cent stamp, appearing in 1923, featured an airplane radiator and a wooden propeller, acknowledging the famous, although unreliable Liberty engine of World War I fame. Also in 1923, a de Havilland biplane was pictured on a 24?cent stamp, one of the few times foreign?built aircraft appeared on a U.S. stamp. The Jenny and de Havilland were mainstays of aviation until William Boeing and Donald Douglas introduced their mail planes. By the time of the International Aeronautical Conference in Washington, D.C., in December 1928, high and low-wing monoplanes were in use, but the Post Office chose to mark the conference event with a stamp picturing the Wright brothers’ Flyer. Over the years, the Flyer has appeared on six stamps. 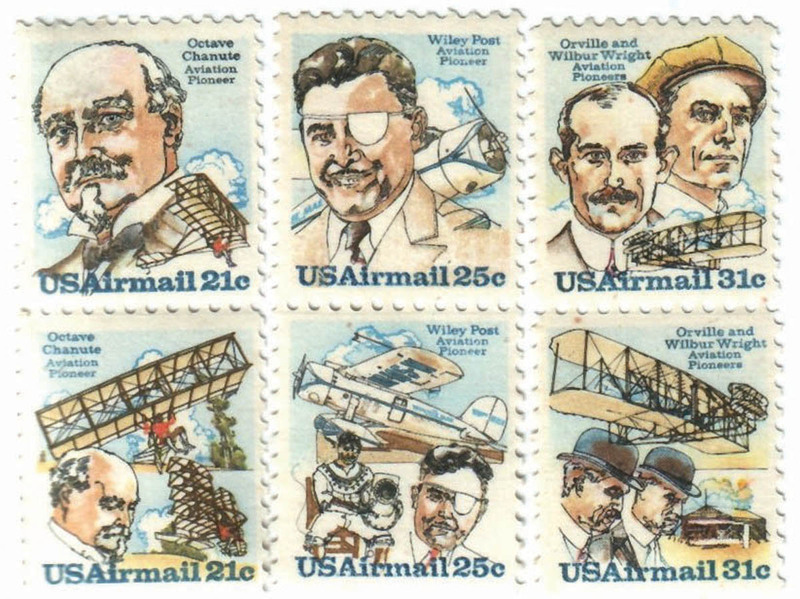 The Wright brothers themselves were first honored on a stamp in 1949, and again on a matched set of stamps in 1976. Richard E. Byrd and Lincoln Ellsworth, both Antarctic explorers, were featured on mated stamps. Henry Ford’s Tri-Motor was on Byrd’s stamp, and Ellsworth’s Northrop Gamma was pictured on his. The Ford Tri-Motor received its own stamp in 1997. Amelia Earhart, probably the world’s most famous female pilot, showed up twice; her Lockheed Electra was in the background on her first stamp. 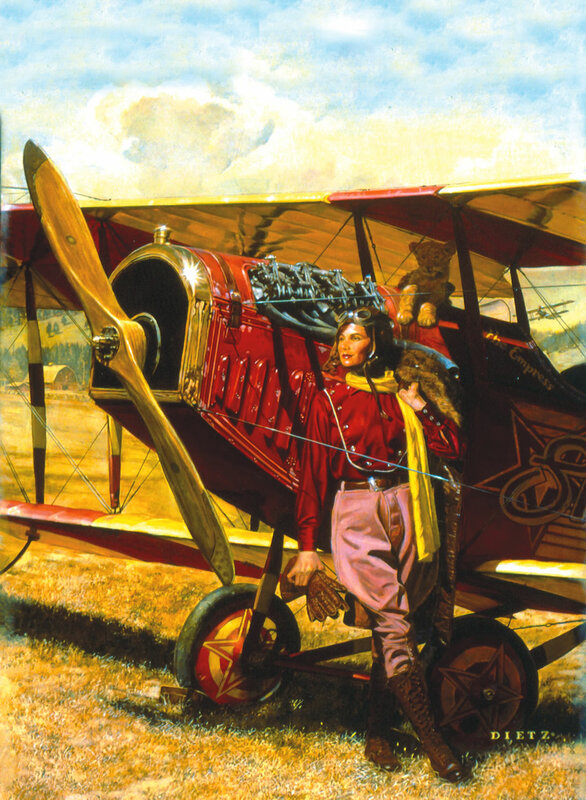 Blanche Stuart Scott was the first American woman to solo in 1910; Scott’s 1910 Curtiss pusher was in the background on her stamp, which appeared in 1980. Glenn Curtiss was honored with a stamp that same year. Harriet Quimby, the first American woman licensed as a pilot in 1911, appeared on a 50?cent airmail stamp in 1991. Bessie Coleman, the first African American in the United States to earn a pilot’s license, in 1921, was honored in February 1995. 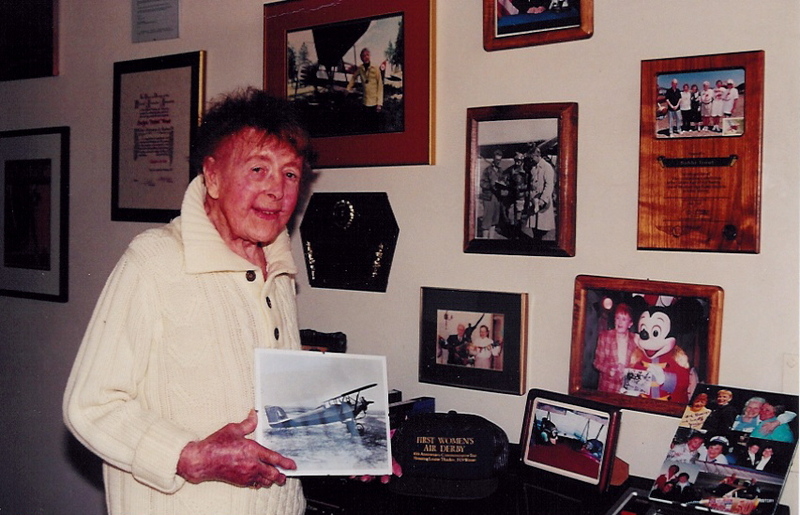 Because of racial discrimination at home, Coleman took her flight lessons and earned her license in France. 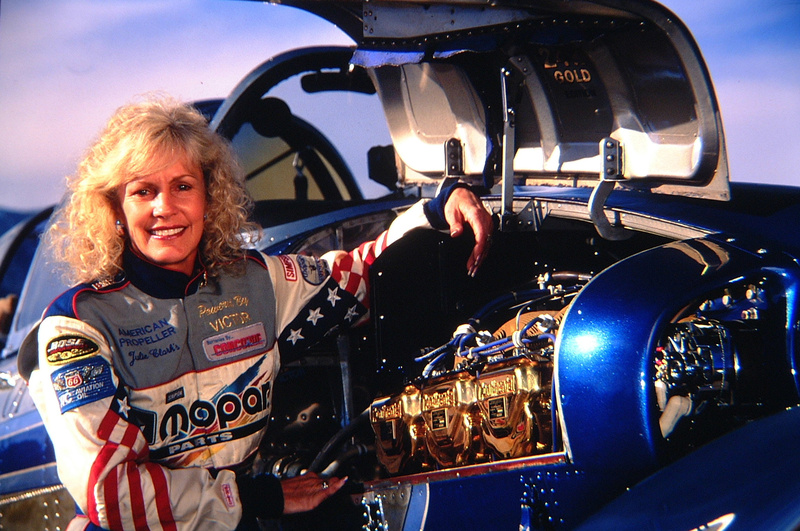 Conspicuously absent until 1996 was Jackie Cochran, a controversial woman who held more speed, distance and altitude records than anyone else, male or female. 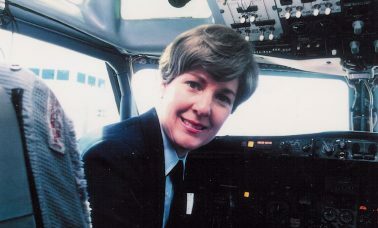 Cochran believed that women were equal to men in piloting skills and promoted women in aviation throughout her career. Missing, too, are the Women Airforce Service Pilots, the World War II civilian group of female pilots that flew 60 million miles, ferrying fighters and bombers in the U.S., freeing male pilots for combat. Space is covered extensively in a series of stamps issued over a period of nearly 30 years. The first honored the Mercury program, and later stamps pictured the space shuttle and beyond, with the deep space probe of Jupiter. 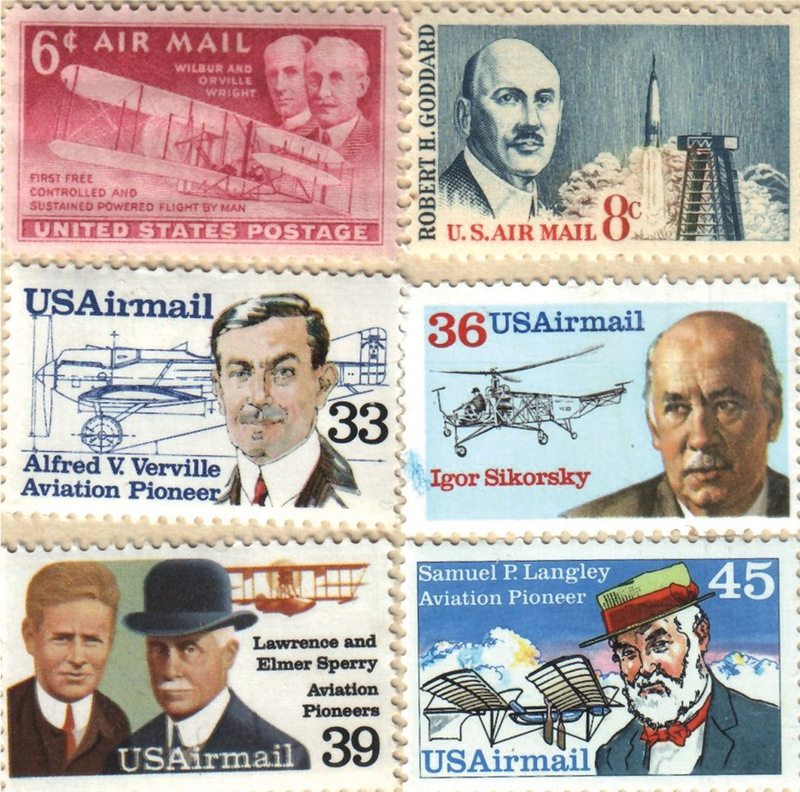 More than a dozen men are honored, but William Boeing, designer of the Model 247, “the world’s first modern commercial airliner,” has not made it to a stamp. Boeing’s Stratocruiser appears on two stamps. The Boeing 707 and 747 also appeared on earlier stamps, but the Boeing 247 didn’t appear until 2005. Donald W. Douglas was responsible for successful commercial airplanes from the DC?1 to the DC-10, and dozens of military planes, but he is also missing from this hall of fame. His DC?3, “the plane that changed the world,” made it to a 36?cent postcard in 1988, 53 years after its birth. The DC-3 earned its own stamp in 1997, as part of a 20-stamp commemorative sheet of Classic American Aircraft. Strangely, a plane that appears to be the early tri-tail design of the DC-5 was on a stamp in 1941, and again in 1944. Douglas halted the production of the DC-5 in World War II in favor of the A-20 attack aircraft. Douglas’ DC?4 made it to a stamp at the height of its popularity, in 1945. Leonardo da Vinci left drawings of a helicopter, dating back to 1410, yet he never made a stamp. 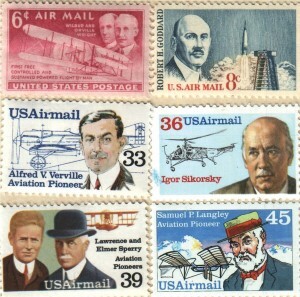 Igor Sikorsky, the Russian emigrant who pioneered the first practical helicopter design, earned a stamp in June 1988. His VS?300, which first flew in 1939, was in the background on his stamp. 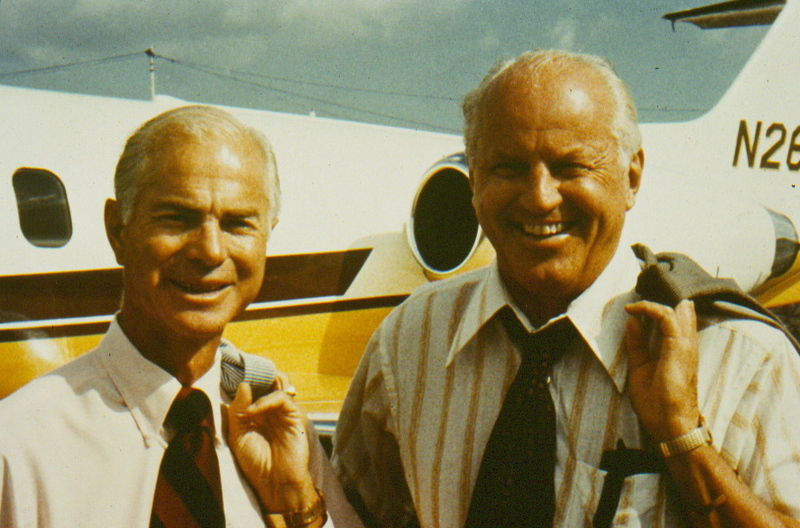 Lawrence and Elmer Sperry were responsible for development of the autopilot and the directional gyroscope in the late 1920s. They were honored in 1985. Alfred V. Verville’s contribution to aviation was a plane called the Packard?Verville with a 638?hp engine, billed as the “wonder plane of the Army.” This low?wing monoplane was, in its day, a leap in technology. In the first Pulitzer Trophy Race in 1920, it averaged 156.5 mph over the 116-mile closed course. It gave energy to General Billy Mitchell’s campaign for faster pursuit planes for the U.S. Army. Verville was honored with a stamp on Feb. 13, 1985. In 1933, Wiley Post set a round?the?world speed record of eight days, 15 hours, 51 minutes, beating the Graf Zeppelin’s longstanding record by more than 12 days. 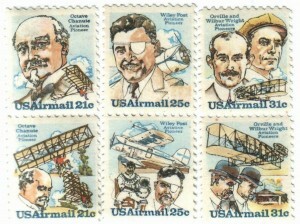 Post flew his way onto a pair of stamps in 1979. One stamp showed his Lockheed Vega, Winnie Mae. Because Post was also a pioneer of high?altitude flying, the second stamp showed him in a pressure suit. 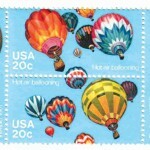 The second 20-stamp aviation commemorative sheet was issued in July 2005. It featured a mix of civilian and military airplanes, and for the first time, showed two of the heavy bombers that helped win the war. 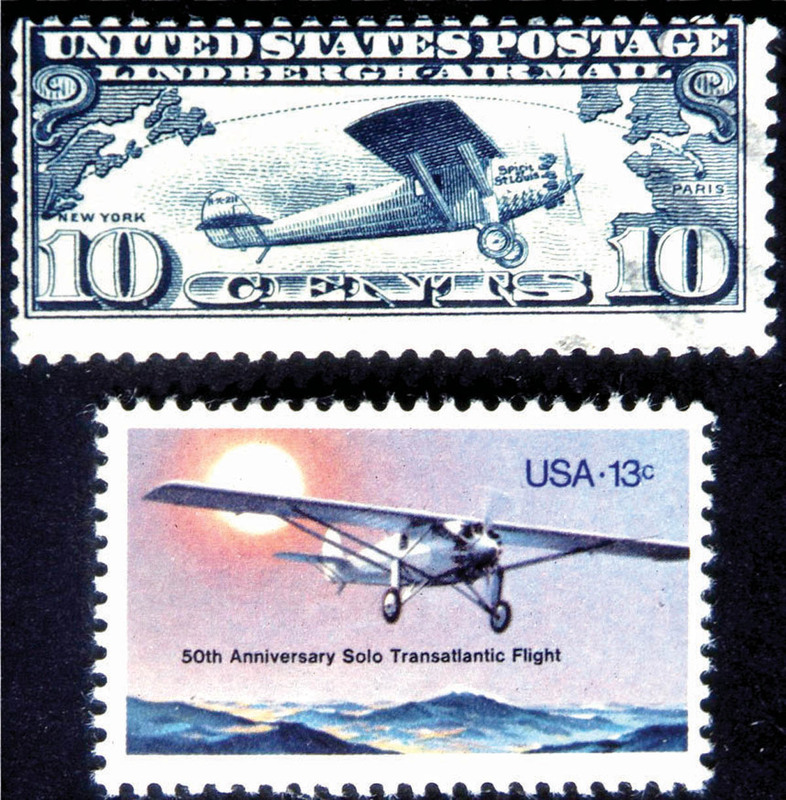 A stamp in 1927 marked airmail pilot Charles Lindbergh’s first transatlantic flight. 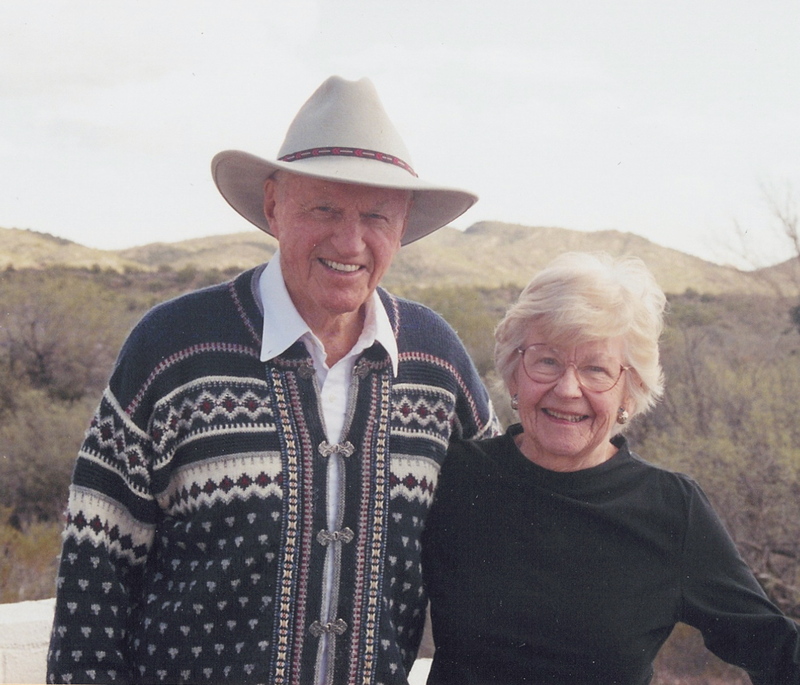 But Lindbergh and his aviator wife and flying partner, Anne Morrow Lindbergh, are absent from this hall of fame, although not from stamps in The Gambia, Ghana and a few other countries. 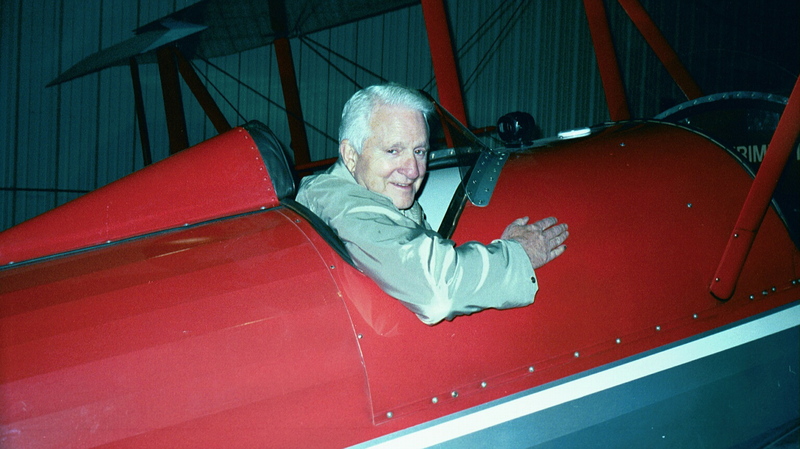 The Ryan monoplane Lindbergh flew across the Atlantic showed up twice, but the plane’s designer, T. Claude Ryan, is absent from the hall of fame. Glenn L. Martin is also absent, but his Martin 202 was pictured on a 10?cent airmail stamp in 1947. The Martin 314, famous as the Clipper, first flew in November 1935, inaugurating transpacific airmail. 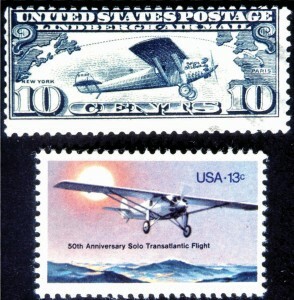 A stamp commemorated the event in 1935, and the Clipper appeared again in 1997, as part of the Classic American Aircraft commemorative sheet. Missing until 1997 were many of the famous warbirds of World War II. 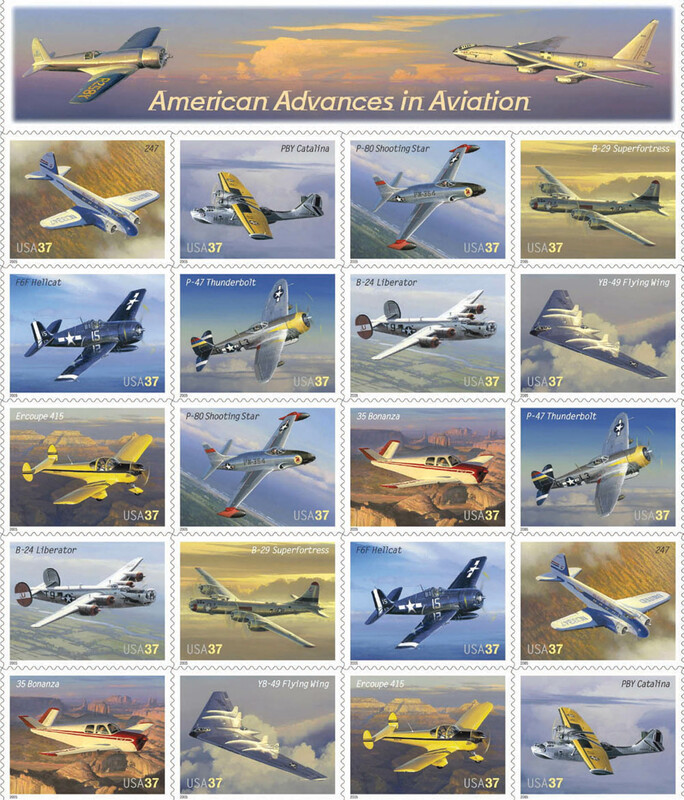 But the B-17 Flying Fortress, the P-51 Mustang, the P-38 Lightning, the Martin B-10, the F4F Wildcat and the F-4U Corsair appeared on the 20-stamp Classic American Aircraft commemorative sheet that year. Until then, the only appearance of a military plane was on the Air Force’s 50th?anniversary stamp. The B?52 bomber was prominent on the stamp, with several jet fighters silhouetted in the background. Navy wings showed up on its 50th?anniversary stamp in 1961, with the Curtiss A?1 Triad, the Navy’s first aircraft, in the background. 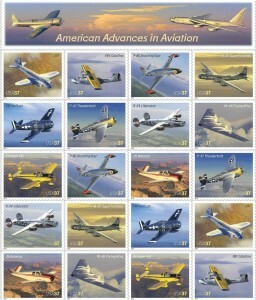 In 2005, more famous World War II fighters and bombers made their first appearance; the F-6 Hellcat, P-47 Thunderbolt, B-24 Liberator, and B-29 Superfortress all appeared on a 20-stamp American Advances in Aviation commemorative sheet. Charles Lindbergh’s transatlantic solo flight was commemorated shortly after his flight, and again 50 years later. The Ryan airplane is one of the few planes that appear more than once on a stamp. Seemingly, unrelated stamps and events were sometimes tied together. The first flight of commercial helicopter service occurred on Jan. 6, 1947, but instead of a helicopter, the First Day Cover marking the event shows a Douglas DC-4 airmail stamp. Space exploration gets wide coverage. A stamp commemorated the Mercury program’s first manned space flights. Two stamps as a matched set commemorated the Gemini IV capsule, with Commander Edward White’s space walk. The Apollo stamp, commemorating man’s first steps on the moon, came out on Sept. 9, 1969, just weeks after the event. 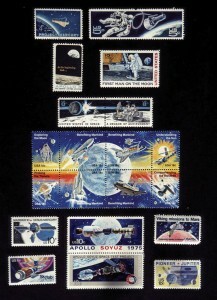 Eight matching stamps, featuring moon and space exploration, came out in 1981, and the space shuttle was prominent on an unusual eight set of stamps. Combined, they depicted various stages of space flight. 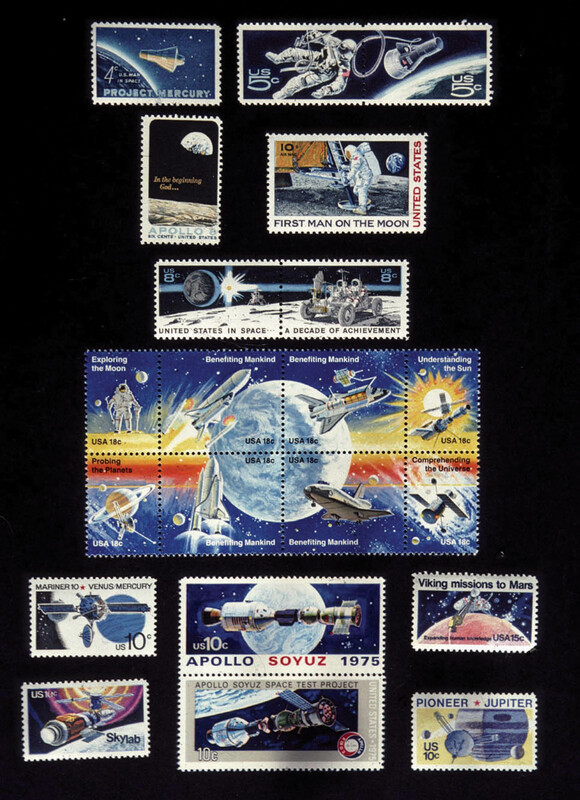 In 1974, the Skylab project made a stamp, and the Apollo-Soyuz joint American?Soviet space effort of 1975 also joined the hall of fame. Significant probes into deep space—Pioneer, Mariner and Viking—also show up. But still missing are stamps commemorating the lost crews of Challenger and Columbia. Outside the U.S., The Gambia, St. Vincent, in the Grenadines, Palau and Somalia have all honored the crew of Columbia. The first to honor the Wright brothers, was issued Dec. 17, 1949, shortly after Orville’s death. Others honored are Robert H. Goddard, “the father of modern rocketry,” Igor Sikorsky, Samuel Langley, Lawrence and Elmer Sperry and Alfred Verville. This hall of fame is far from complete, but it does provide an overview of aviation history. In the years to come, more aviation stamps will be produced, but some events and persons who justifiably should earn a spot will never be thus honored. 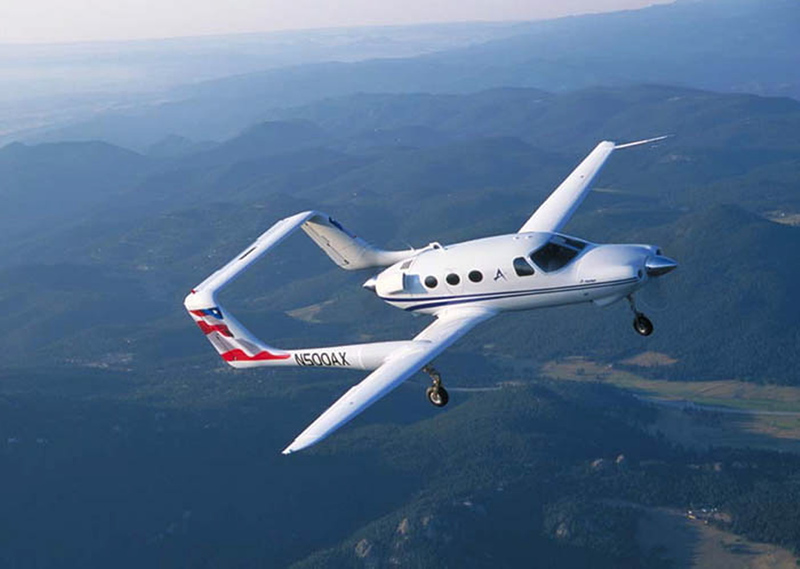 That is life, and aviation history, as told by the U.S. Postal Service. On top is a Martin 202 flying over the Pan American Union building in Washington, D.C. (Left) is a Lockheed Constellation over-flying the New York City skyline. (Right) is a Boeing Stratocruiser flying over the Oakland Bridge in San Francisco. On Oct. 1, 1861, the Union Army formed the Balloon Corps. They used the hydrogen balloon Intrepid for aerial reconnaissance. On Nov. 11, 1935, the National Geographic Society’s Explorer 11 balloon set an altitude record of 72,395 feet.